Left-Right: Eric Mannella, Eduardo Fernandes, Steven Rosati and myself. Rapid Water Gallery Studio. Last week I had the pleasure of painting in my studio with a group of Montreal area artists whose work I admire greatly. This get together came about via the magic of the social network, namely Facebook. Eric for sometime had been inviting me to come to his home base of Atelier de Bresoles in Montreal’s Old Port or suggesting he might get together with me in Kahnawake at my studio. This had been going on for maybe two years or more. Frankly I think so highly of him I was intimidated. Though I am loathe to admit it, I must. Still, Eric’s persistence paid off and I relented. I just couldn’t dodge him again. No telling when an invitation would be forthcoming again. 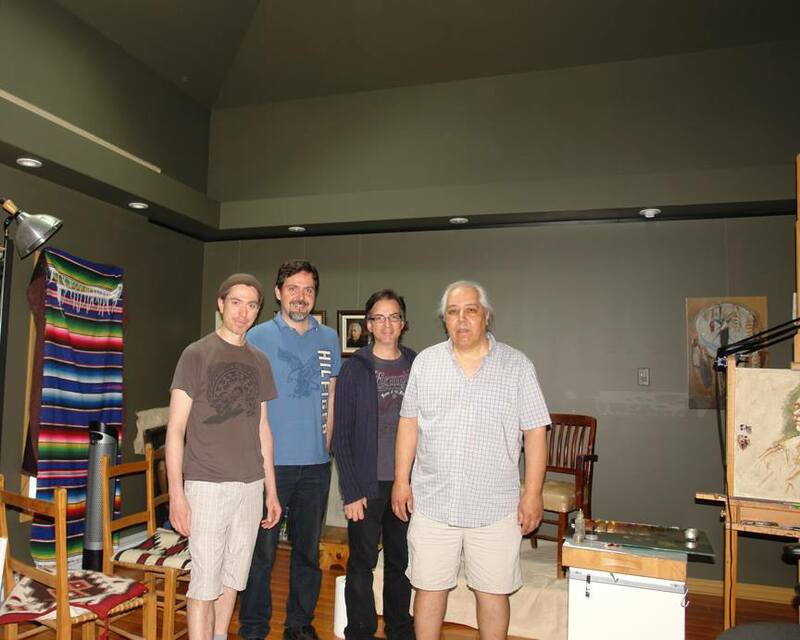 And so it was that last Thursday, the deal struck, the model engaged ( Mr. Tassisiak Tuki Loft of Kahnawake) the first of what I hope will be many painting dates took place. I seem to have dubbed our group The Four Amigos. Initially, I thought it would only be me and Eric getting together but then he asked if I’d mind if one of his students accompanied him. No problem. Then he said that one of his friends, Steven Rosati wanted in. I had been a follower of Steven’s amazing portrait and figurative work for some time and both he, Eric and I had been Facebook buddies for some time. Tassisiak Tuki Loft posing in 18th century ruffled shirt, shell gorget and porcupine quilled knife. 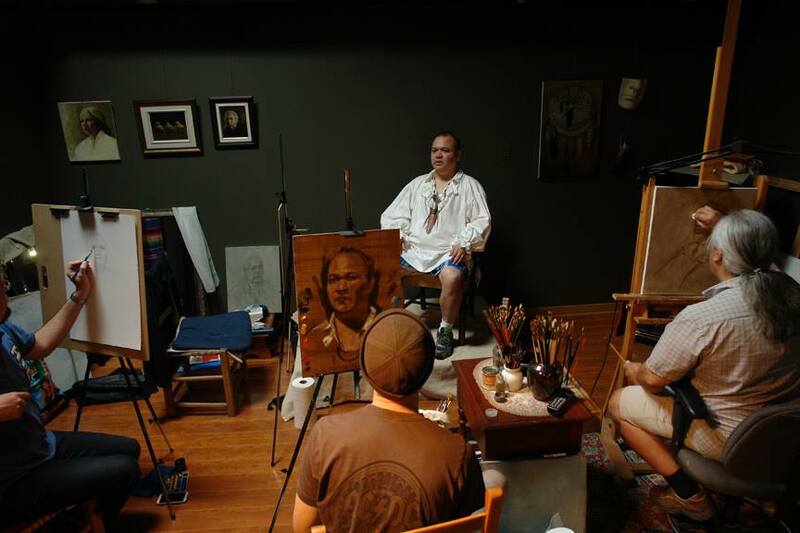 In the foreground is Steven Rosati’s drawing which he was soon to paint. Off to the right I am muddling along and getting nowhere fast. I at least look the part. Actually had I not been so nervous about being in the room with this talented group of guys I would have done better to have begun my own attempt as Steven did. No matter, there was much to share and learn. Eric is a consummate painter and teacher and along with his wife Alana Benham run one of the best atelier schools in the country. Both are graduates of the New York Academy of Art in NYC. 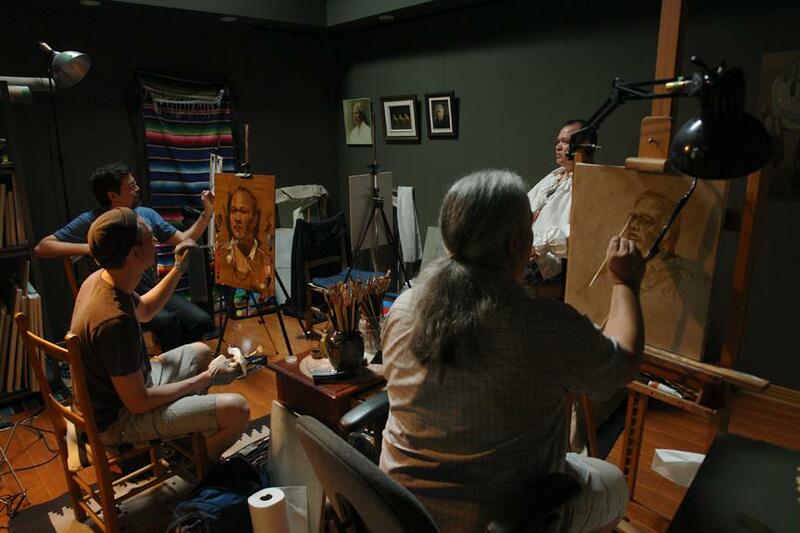 Eric deftly working his brush and paint in a wonderful demonstration of alla prima painting. Note how he places his colors directly on his panel. Mixing his colors directly on his panel allows Eric to see his color in the same light as the painting without the stress of constantly bending over to a flat palette. Definitely a tip I will take to heart. 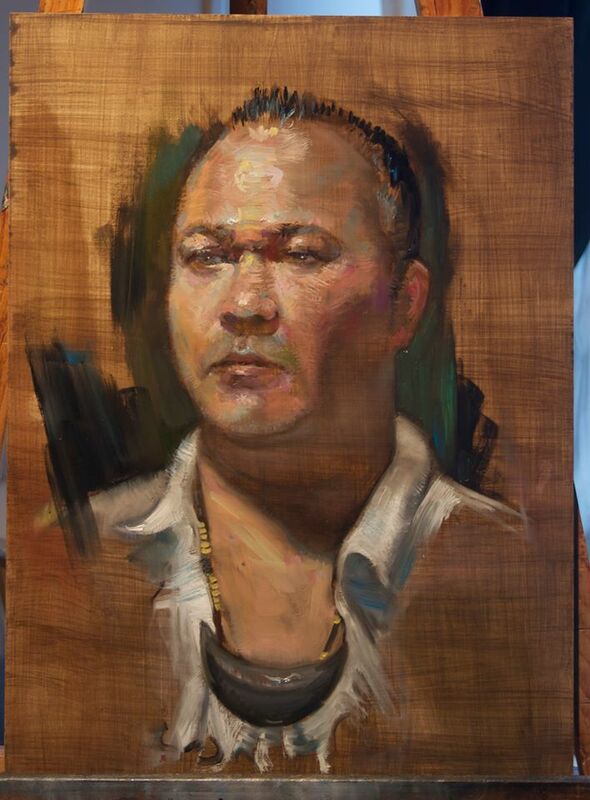 Also worthy of noting, Eric, a recent father, works solvent-free using only linseed oil to thin his colors. He began by accessing the shadow and light patterns and mapping these out in umber thinned to the consistency of ink. 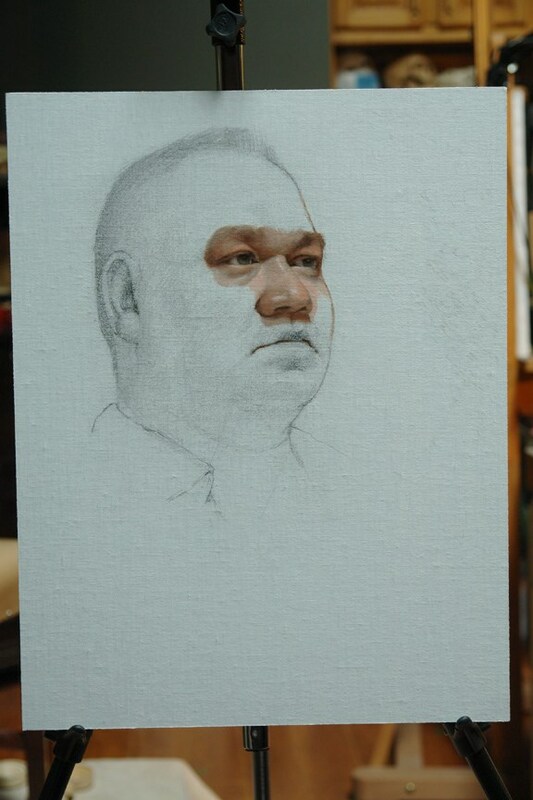 At this stage of his portrait of Tuki, Eric had begun laying in his color notes. Eric’s completed portrait of our model Tuki Loft. 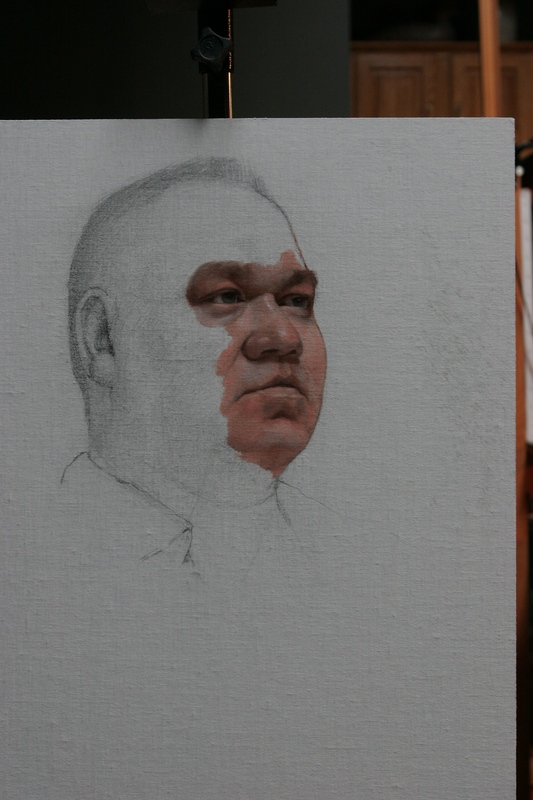 Eric explained to me that he lays in a bit of background color around the head first then beginning the flesh tones he places a mosaic of colored strokes which he will build up while avoiding the temptation of ‘blending’ and thereby muddying his colors. 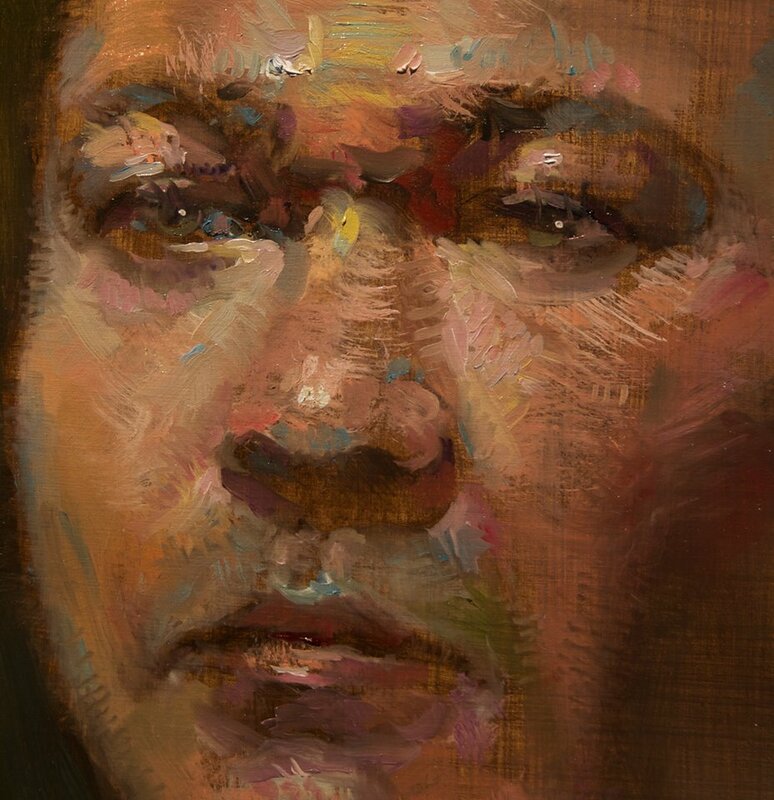 In this close-up you can see the web of colored strokes making up Eric’s flesh tones. What this photo cannot adequately show is how the paint surface sparkles. Quite remarkable really. To Eric’s left is his student Eduardo Simoes Fernandes, an incredibly gifted artist who has been studying at Atelier de Bresoles (http://www.atelierdebresoles.com/ ) for the past year or two. 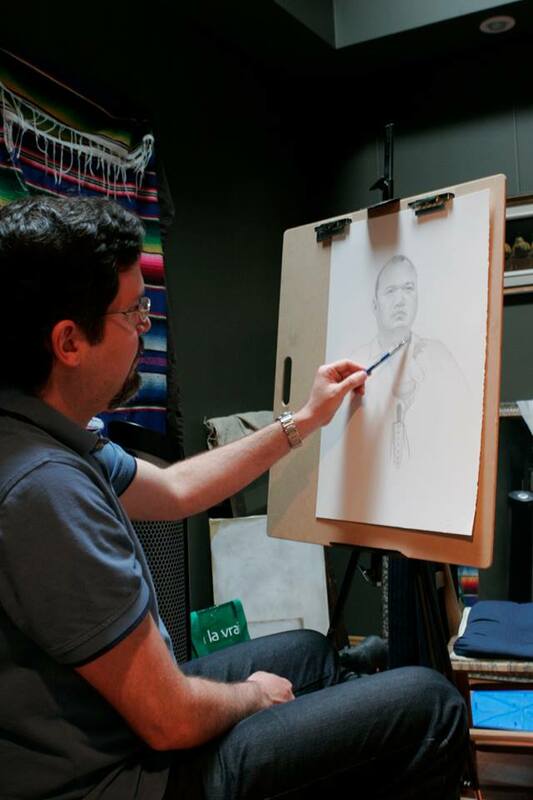 Eduardo chose to forgo paint for graphite with his portrait of Tuki. Eduardo’s drawing skills are well honed. In the 5 hours available Eduardo produced a drawing with a high degree of finish. This is a testament to both the student and his teacher. A native of Brazil, Eduardo emigrated to Canada where he has been working in the burgeoning field of computer gaming graphics. 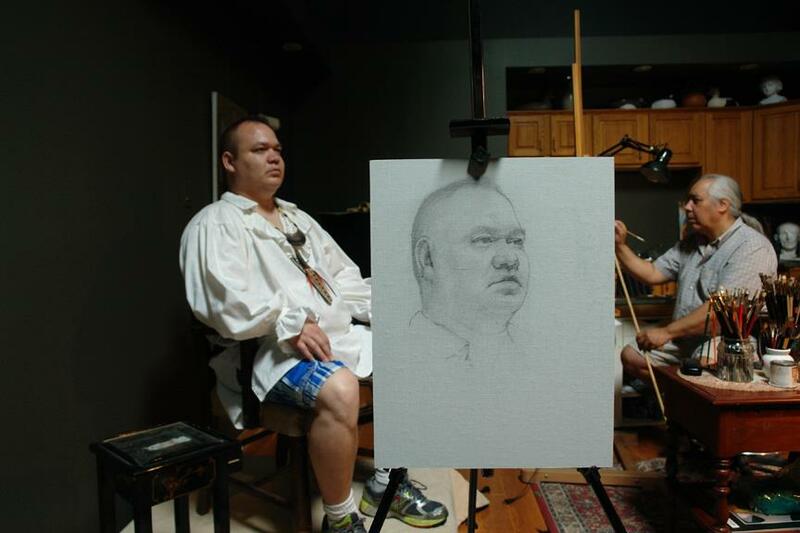 His first real study of traditional drawing and painting has taken place at Eric and Alana’s atelier. Eduardo’s finished portrait of TassisiakTuki Loft. 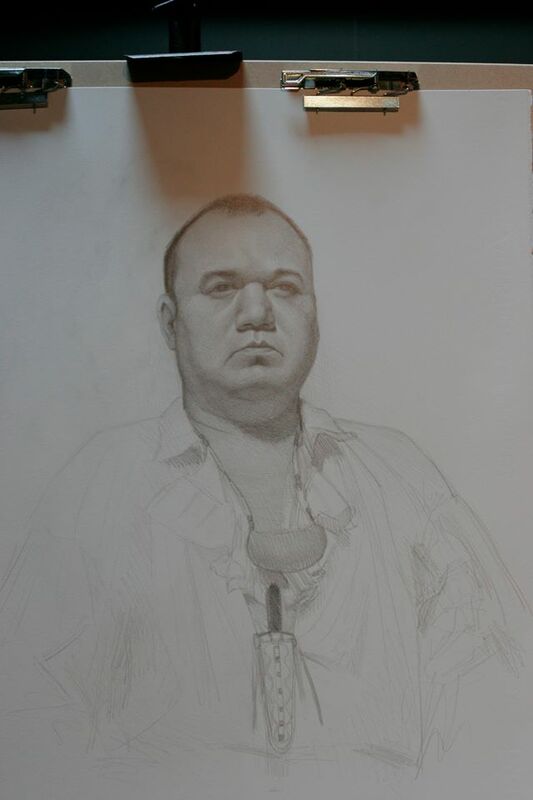 For award winning portrait and figurative painter Steven Rosati of Montreal, this drawing would have stood him well as a finished drawing but it was only a step along the way. 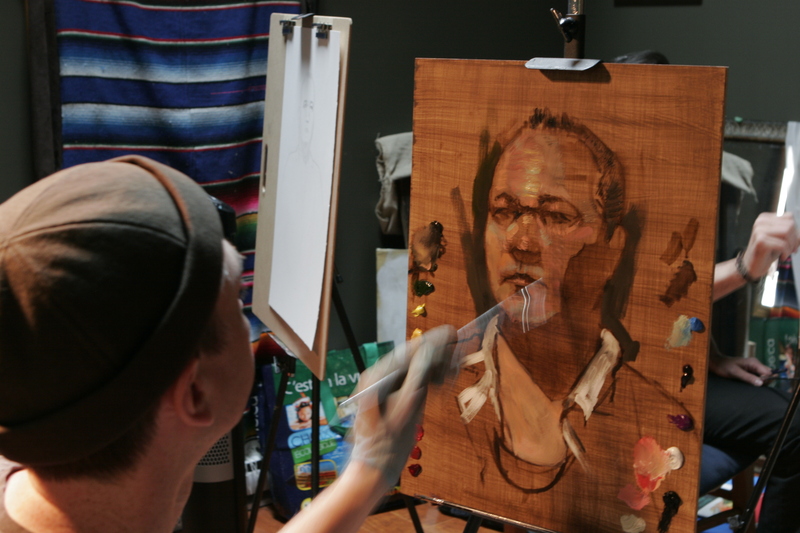 Steven’s method for this piece was to paint the features in what some would call ‘window shade’ fashion. To witness it unfold was to watch a magic happen. 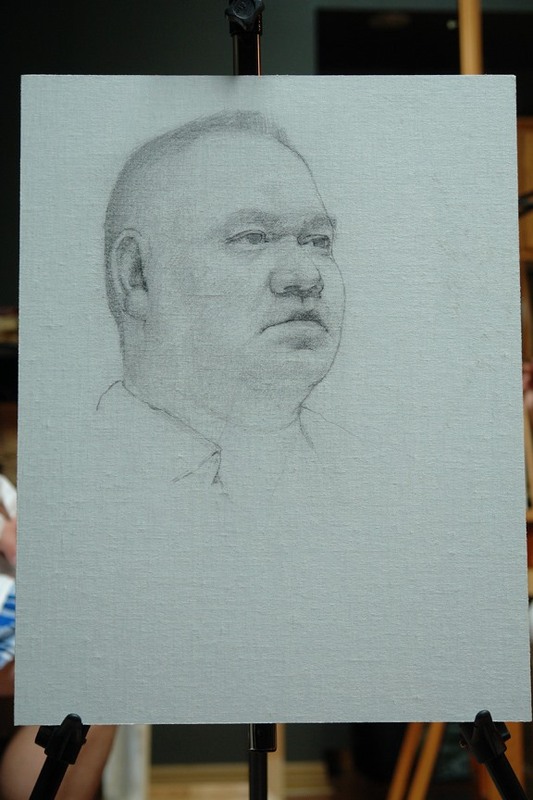 Steven began with the eyes of Tuki’s portrait then work his way down subtly modelling and turning the form. This was the result of Steven’s efforts for the day. 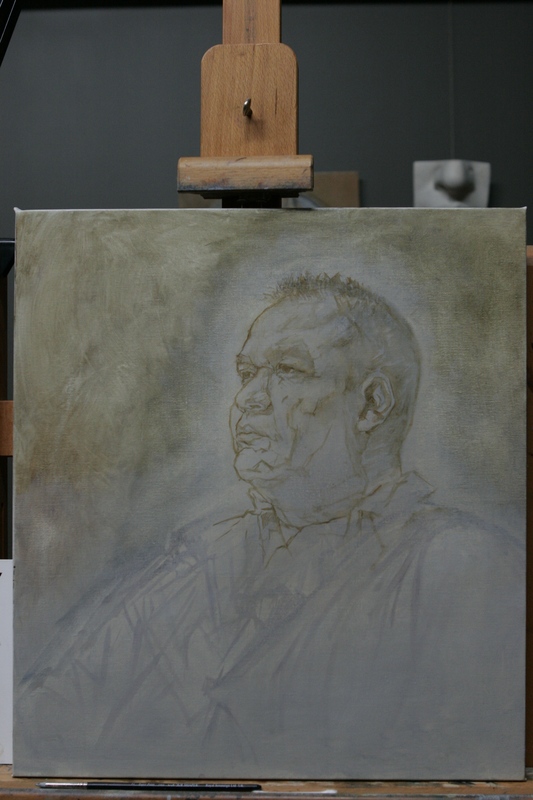 Steven’s painting surface was an oil primed linen panel – Claessens #13 portrait grade. He uses water miscible oil colors. As for my own efforts, I can say that I struggled and my own results that day were not what I would consider on par with that of my friends. That is not to say my day was a waste or a write-off. For whatever reason I found myself floundering in my drawing with the brush…basically choking. Nevertheless, I am not so foolish as to not take advantage of Eric’s teaching ability. Eric was more than willing. In the end I decided to sand down the paint from my canvas to begin the portrait anew having engaged Tuki to come in for a quick photo shoot over the weekend. He will come in to sit for me again so that I can paint from life getting the color. Niawen kowa/ Thanks very much for your interest. Discover Montreal's best upcoming artists and events.